At NAMM back in January, Casio announced the arrival of two new synthesisers, almost 30 years after the company's classic CZ series made its debut. Now we've one of those new instruments - the XW-P1 Performance Synthesiser, in special limited edition gold finish - to give away to one lucky reader. In the words of Casio: "The XW-P1 Performance Synthesizer is equipped with a step sequencer allowing artists to build and mix performances as they go, as well as a six oscillator monophonic solo synth that utilizes Casio's exclusive Hybrid Processing Sound Source (HPSS). The unit also provides screaming virtual analog monophonic leads and basses, drawbar organs, complex layers, stereo pianos, drums and more to produce the sounds and real-time control any performing musician needs." To find out what we think of the XW-P1, read the full review. 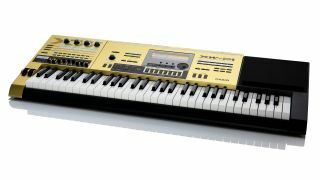 Casio's classic 1980s instrument the VL-Tone VL-1 famously combined a monophonic synth with what other feature?